A motorist will be considered drunk, if the instrument shows the presence of 0.16 milligrams of alcohol in one liter of exhaled air, or 0.35 grams of alcohol in one liter of blood. Russia’s eighteen-month-long battle over whether some content of alcohol can be permitted in the driver’s blood, and what that content may be like has drawn to a close. The issue has proved of great social importance, because many drivers were stripped of their driving licenses for having the slightest presence of alcohol in blood even though the instrument’s error was the sole factor to blame. Anger in society kept mounting. Also, the amendments tighten responsibility for drunk driving. The first such violation will entail driving license suspension for a period of 18 to 24 months and a fine of 30,000 roubles (around $1000), and a second one, three-year license suspension and a fine of 50,000 rubles. The same punishment will be established for those who refuse to undergo medical examination. At present drunk driving is punishable with license suspension only. 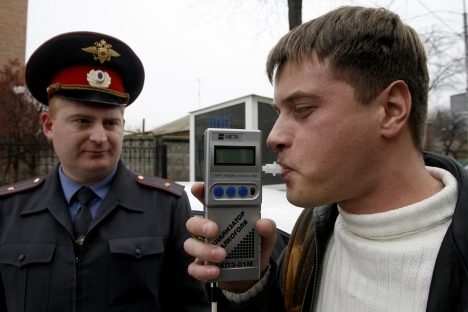 In Moscow and the Moscow Region, according to official statistics, 12 percent of those punished for drunk driving had less than 0.2 promille.